The whole #friendlywave thing (where I explain your wave picture) is starting off great! Here is one that reached my via my Twitter; link to thread here. 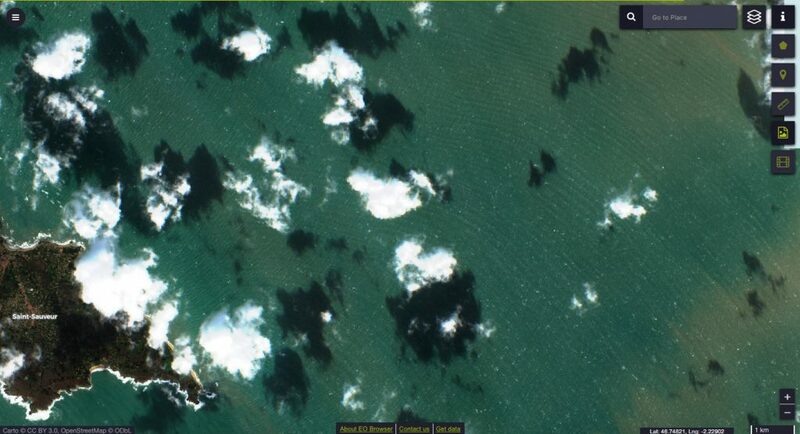 What’s going on in the north east of Île d’Yeu, France? Here are four pictures from the Twitter thread that got me intrigued: Because of the awesome waves they were displaying, but also because they introduced me to ESA’s EO browser which is so amazing that I don’t think I will be able to stop playing anytime soon! First, a true color image of the Île d’Yeu and, more importantly, the wave field around it (Click on all pictures to enlarge). …this checkerboard pattern of waves! 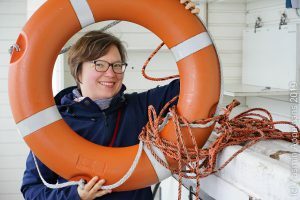 Now the question is what causes those waves. Well, let’s find out, shall we? I couldn’t figure out exactly where the image above was from, but I am seeing a very similar pattern in the pictures that I saved off the EO browser myself. 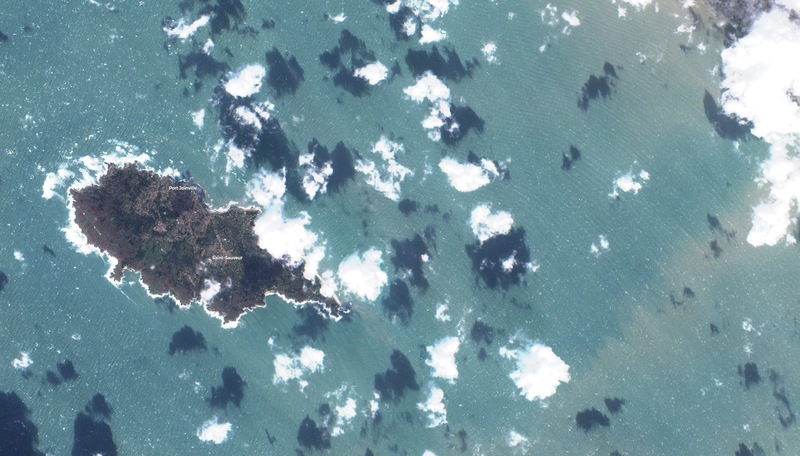 True color image of Île d’Yeu and surrounding ocean, acquired with EO browser, January 28th, 2019. Here is the same image, except with my annotations on it. I have marked a couple of wave crests to show what I think is going on. What I see here (and please let’s discuss this! I’m super curious to hear what you think!) is a wave field coming in from west northwest-ish (see straight-ish fronts on the top left). 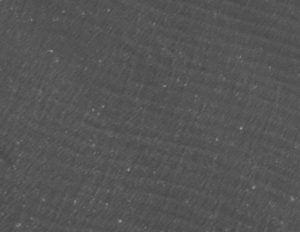 When this wave field encounters an obstacle in its path (the island), it gets diffracted, kind of as if there were two very wide slits on either side of the island (a very simple example of that here). 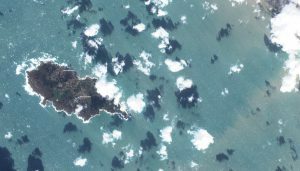 It’s difficult to follow the wave crests that pass the island on its north side, but the ones that go round the south side are clearly visible as they turn around the eastern tip of the island. And here is my annotated version of the wave field. 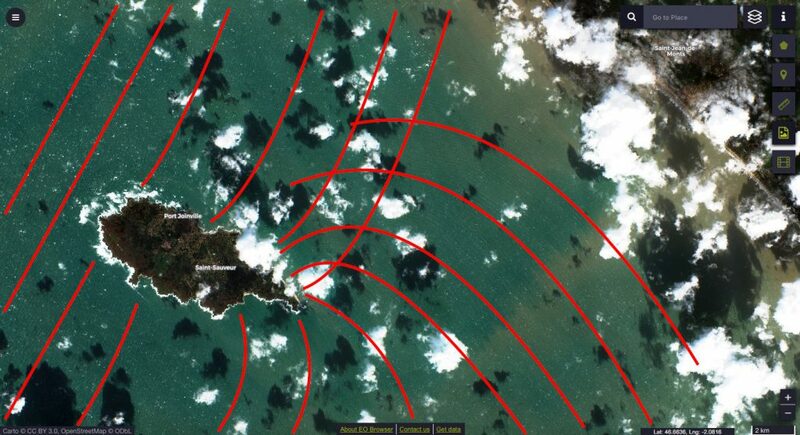 You recognise the wave crests that were propagating along the southern side of the island, then turned around the eastern tip and are now spreading northward. And you see the wave crests of the waves that travelled along the north coast all along. Notice how they are crossing in a crisscross pattern? The area with the really dense red checkered pattern is the one I think was shown on the original picture on Twitter. So my interpretation is that it’s an interference pattern of waves, all originating in the same wave field, being diffracted l’Île de Yeu. What do you think? Do you agree? What I find quite interesting is that it’s very easy to follow the crests that propagate northward around the eastern tip, but a lot more difficult to do the same for the ones propagating southward. I could imagine that the explanation is the topography: The waves propagating in the north of the island were in shallower water for pretty much the length of the island, so they might have lost a lot of their energy already, whereas the ones from the south only run into shallower water once they’ve turned around the eastern tip of the island. 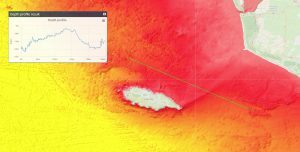 Thanks, Rémi, for pointing me to ESA’s awesome EO browser and to your super interesting Twitter! P.S. : Speaking of topography: Of course the change in water depth could also have an effect on the wave field by refracting the waves towards the slower medium, i.e. the shallower water. But I don’t think that’s the case here. Do you? 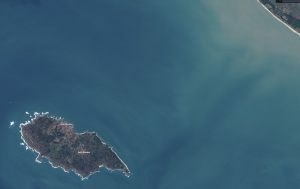 This entry was posted in #friendlywave and tagged diffraction, dispersion relation, Île d'Yeu, water depth, waves on January 28, 2019 by mglessmer.